On April 17, 2019 the April 2019 Duke/CFO Global Business Outlook was released. It contains a variety of statistics regarding how CFOs view business and economic conditions. Sixty-seven percent of U.S. CFOs believe that the U.S. will be in recession by the third quarter of 2020, and 84 percent believe that a recession will have begun by the first quarter of 2021. The survey found 38 percent of CFOs predicting recession by the first quarter of 2020. The survey asked the CFOs which economic variables will provide the most accurate indication that their own firms are experiencing a slow-down. Almost half (47 percent) of CFOs said they consider GDP growth to be one of the three most important indicators of their own firm’s fortunes. Consumer spending (39 percent), commodity prices (31 percent) and interest rates (29 percent) were also highly ranked indicators. CFOs expect their capital spending and revenue to increase by 5 percent over the next 12 months. CFOs predict hiring to increase by 2 percent and wages to grow by 3 percent. It should be interesting to see how well the CFOs predict business and economic conditions going forward. I discussed past various aspects of this, and the importance of these predictions, in the July 9, 2010 post titled “The Business Environment”. I post various economic forecasts because I believe they should be carefully monitored. However, as those familiar with this site are aware, I do not necessarily agree with many of the consensus estimates and much of the commentary in these forecast surveys. This entry was posted in Business, Economic Forecasts and tagged Business, CFO and CEO Confidence, Economic Forecasts on April 18, 2019 by Ted Kavadas. Looking ahead, CEOs’ expectations regarding the economic outlook have improved slightly from last quarter. Some 14 percent now expect economic conditions to improve over the next six months, up from 12 percent in the fourth quarter. Meanwhile, about 42 percent expect economic conditions will worsen, down from 52 percent last quarter. CEOs’ expectations regarding short-term prospects in their own industries over the next six months were also moderately less pessimistic. Now, 19 percent anticipate an improvement in conditions, up from 14 percent last quarter. Moreover, 37 percent expect conditions will worsen, down from 44 percent in the fourth quarter. The CEO Economic Outlook Index decreased to 95.2 in the first quarter of 2019, a decrease of 9.2 points from the previous quarter. Despite this decrease, the Index surpassed its historical average of 82.4. This marks the ninth consecutive quarter where the Index has exceeded the historical average, signaling a continued positive direction for the U.S. economy. In their second estimate of 2019 U.S. GDP growth, CEOs projected 2.5 percent growth for the year, down from their 2.7 percent estimate in the previous quarter. Additional details can be seen in the sources mentioned above. This entry was posted in Business, Economic Forecasts and tagged Business, CFO and CEO Confidence, Economic Forecasts on April 9, 2019 by Ted Kavadas. CEOs’ assessment of current economic conditions turned pessimistic in the fourth quarter, with only 21 percent saying conditions are better compared to six months ago, down from 49 percent last quarter. Meanwhile, about 39 percent say conditions are worse, up from less than 8 percent in the prior quarter. CEOs were also much more negative about current conditions in their own industries compared to six months ago. Now, just 21 percent say conditions are better, down from 31 percent last quarter, while those who say conditions have worsened rose to 35 percent, up from 25 percent last quarter. Looking ahead, CEOs’ expectations regarding the economic outlook have also turned negative. Now, just 12 percent expect economic conditions to improve over the next six months, down from 23 percent in the third quarter. Meanwhile, about 54 percent expect economic conditions will worsen, compared to 22 percent last quarter. CEOs’ expectations regarding short-term prospects in their own industries over the next six months were also more pessimistic. Now, only 14 percent anticipate an improvement in conditions, down from 22 percent last quarter, while 44 percent expect conditions to worsen, up from 19 percent in the third quarter. Declining 4.9 points from 109.3 in the third quarter of 2018, the Q4 2018 CEO Economic Outlook Index of 104.4 ranks among the top 10 percent of all readings in the survey’s 16-year history and is well above the historical average of 82.1. This is the eighth straight quarter where the Index has exceeded its historical average, signaling a continued positive direction for the U.S. economy. In their first estimate of 2019 U.S. GDP growth, CEOs projected 2.7 percent growth for the year ahead. This entry was posted in Business, Economic Forecasts and tagged Business, CFO and CEO Confidence, Economic Forecasts on January 10, 2019 by Ted Kavadas. On December 12, 2018 the December 2018 Duke/CFO Global Business Outlook was released. It contains a variety of statistics regarding how CFOs view business and economic conditions. Nearly half (48.6 percent) of U.S. CFOs believe that the nation’s economy will be in recession by the end of 2019, and 82 percent believe that a recession will have begun by the end of 2020. In 2019, CFOs expect sub-3% growth for the U.S. economy, with accompanying capital spending and employment growth of about 3 percent. Moreover, their forecasts are skewed to the downside, with a one-in-ten chance that annual real growth will be a meager 0.6 percent. In this worst-case scenario, CFOs would expect their capital spending to fall by 1.3 percent and for hiring to remain flat. This entry was posted in Business, Economic Forecasts and tagged Business, CFO and CEO Confidence, Economic Forecasts on December 13, 2018 by Ted Kavadas. CEOs’ assessment of current economic conditions is less positive, with 49 percent saying conditions are better compared to six months ago, down from 74 percent last quarter. However, 43 percent of CEOs say conditions have remained the same, and only 8 percent say conditions are worse. CEOs were also less optimistic about current conditions in their own industries compared to six months ago. Now, about 31 percent say conditions are better compared to 51 percent last quarter. Looking ahead, CEOs’ expectations regarding the economic outlook are also less optimistic than last quarter. Now, just 23 percent expect economic conditions to improve over the next six months, compared to 48 percent in the second quarter. About 22 percent expect economic conditions will worsen, compared to 14 percent last quarter. CEOs’ expectations regarding short-term prospects in their own industries over the next six months were also less optimistic. Now, only 22 percent anticipate an improvement in conditions, down from 42 percent last quarter. Some 19 percent expect conditions to worsen, up from just 9 percent in the second quarter. This entry was posted in Business, Economic Forecasts and tagged Business, CFO and CEO Confidence, Economic Forecasts on October 9, 2018 by Ted Kavadas. On September 12, 2018 the September 2018 Duke/CFO Global Business Outlook was released. It contains a variety of statistics regarding how CFOs view business and economic conditions. The proportion of firms indicating they are having difficulty hiring and retaining qualified employees is at a two-decade high, with 53 percent of CFOs calling it a top four concern. That’s up sharply from the 41 percent who said the same thing last quarter. “The tight labor market continues to put upward pressure on wages,” said Chris Schmidt, senior editor at CFO Research. “Wage inflation is now a top five concern of U.S. CFOs.” Employees are willing to leave their jobs for greener pastures. Over the past 12 months, U.S. CFOs report they had to replace 14 percent of their workforces, compared to 13 percent turnover in 2016. Among companies that list hiring as a top concern, 56 percent have increased salaries to improve their chances of hiring and retaining workers; 31 percent have increased HR budgets to better advertise positions; 29 percent have increased vacation or flex hours; and 21 percent have improved health care benefits. The Optimism Index about the U.S. economy declined to 70 this quarter, compared to an all-time high of 71 last quarter, on a 100-point scale. CFO optimism about their own firms’ financial prospects increased to 71.4, the highest level since 2007. Optimism fell in Africa, Europe, and Latin America and held steady in Asia. The survey’s CFO Optimism Index is an accurate predictor of future hiring and overall GDP growth. This entry was posted in Business, Economic Forecasts and tagged Business, CFO and CEO Confidence, Economic Forecasts on September 17, 2018 by Ted Kavadas. CEOs’ assessment of current economic conditions was about the same as in the first quarter of 2018, with 74 percent saying conditions are better compared to six months ago. CEO sentiment was also virtually unchanged regarding the assessment of current conditions in their own industries, with about 51 percent saying conditions are better than six months ago. Looking ahead, however, CEOs’ expectations regarding the economic outlook are much less optimistic than last quarter. Now, just 48 percent expect economic conditions to improve over the next six months, compared to 63 percent in the second quarter. CEOs’ expectations regarding short-term prospects in their own industries over the next six months were relatively flat, with only 42 percent anticipating an improvement in conditions. The Q2 2018 CEO Economic Outlook Index — a composite of CEO expectations for sales and plans for capital spending and hiring over the next six months — fell to 111.1 in the second quarter of 2018, declining 7.5 points from 118.6 in the first quarter. While this is the first time the Index has declined in nearly two years, the Index remains well above its historical average of 81.2 for the sixth straight quarter. This signals a continued positive direction for the U.S. economy despite modest declines in all three components of the Index. The new survey also shows a CEO projection of 2.7 percent U.S. GDP growth in 2018, a small decrease from the 2.8 percent projection last quarter. CEO plans for hiring dipped slightly to 95.5, down 3.0 points from the previous quarter. Plans for capital investment fell to 107.6, a decrease of 7.8 points from Q1 2018. Expectations for sales fell to 130.3, a decrease of 11.6 points from last quarter. This entry was posted in Business, Economic Forecasts and tagged Business, CFO and CEO Confidence, Economic Forecasts on July 10, 2018 by Ted Kavadas. On June 13, 2018 the June 2018 Duke/CFO Global Business Outlook was released. It contains a variety of statistics regarding how CFOs view business and economic conditions. This entry was posted in Business, Economic Forecasts and tagged Business, CFO and CEO Confidence, Economic Forecasts on June 13, 2018 by Ted Kavadas. CEOs’ assessment of current economic conditions was slightly more positive, with 75 percent saying conditions are better compared to six months ago, up from 71 percent in the fourth quarter of last year. CEOs were also moderately more optimistic in their appraisal of current conditions in their own industries. Now, 51 percent say conditions in their own industries have improved, up from 49 percent last quarter. Looking ahead, CEOs’ expectations regarding the short-term outlook was significantly better. Now, 63 percent expect economic conditions to improve over the next six months, compared to just 47 percent last quarter. CEOs, however, were only slightly more upbeat about short-term prospects in their own industries over the next six months, with 43 percent anticipating conditions will improve, versus 41 percent last quarter. The Business Roundtable Q1 2018 CEO Economic Outlook Index – a composite of CEO projections for sales and plans for capital spending and hiring over the next six months – increased to 118.6 in the first quarter of 2018, the highest level since the survey began in the fourth quarter of 2002. The survey was conducted between February 7 and February 26, 2018. Results reflect renewed CEO optimism and confidence following passage of the Tax Cuts and Jobs Act, but do not capture effects of President Trump’s March 8, 2018, announcement of steel and aluminum tariffs. The Q1 2018 Index exceeded its previous high point of 113 in 2011. The Index has significantly surpassed its historical average level of 81.2. All three components of the Index reached record highs, signaling a positive direction for the U.S economy. CEO plans for hiring rose to 98.5, up 22.8 from the previous quarter. Plans for capital investment rose to 115.4, up 22.7 from Q4 2017. Expectations for sales reached 141.9, an increase of 19.9 from the last quarter. In their second estimate for GDP in 2018, CEOs project 2.8 percent GDP growth for the year, compared to the previous quarter’s estimate of 2.5 percent for the year. This entry was posted in Business, Economic Forecasts and tagged Business, CFO and CEO Confidence, Economic Forecasts on April 6, 2018 by Ted Kavadas. On March 7, 2018 the March 2018 Duke/CFO Global Business Outlook was released. It contains a variety of statistics regarding how CFOs view business and economic conditions. Forty-four percent of U.S. companies plan to increase wages more than they would have without tax reform. Thirty-eight percent plan to increase employment and 36 percent will increase domestic investment. Thirty-one percent will increase cash holdings. Among companies with defined benefit pensions, 28 percent will increase pension contributions. Due to tax reform, the effective (or average) tax rate for U.S. companies is expected to fall by about 5 percent, from 24 percent to 18.8 percent. The Optimism Index in the U.S. increased to 71 on a 100-point scale this quarter, an all-time high. 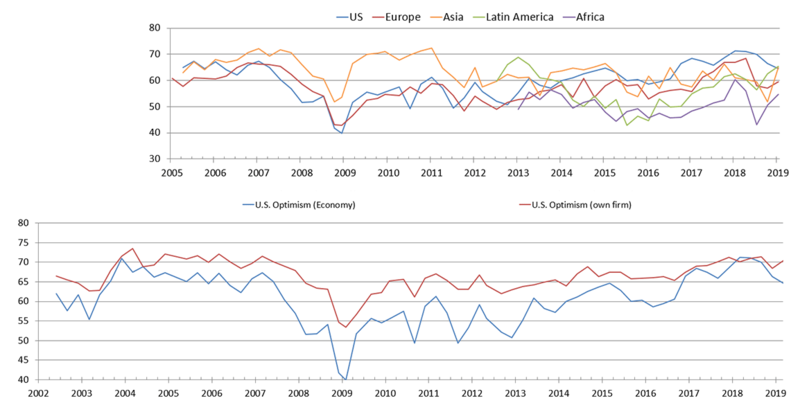 Optimism is up around the world, anticipating strong global economic conditions. The proportion of firms indicating they are having difficulty hiring and retaining qualified employees remains at a two-decade high, with 45 percent of CFOs calling it a top concern, up from 43 percent last quarter. The median U.S. firm says it plans to increase employment by a median 3 percent in 2018. This entry was posted in Business, Economic Forecasts and tagged Business, CFO and CEO Confidence, Economic Forecasts on March 8, 2018 by Ted Kavadas.